At A Legendary Event, Atlanta’s award-wining floral team is busy designing magnificent centerpieces. For color and pizzazz, we love including lemons and limes for a less predictable touch. With summer sizzling, now is the time to let some sun into your celebration and brighten your home with brilliant hues of yellow and orange. Legendary Floral Director Jeanna Graham explains how citrus became a hit for A Legendary Event. “It started when I was making a Spanish tablescape. I was inspired by the oranges, lemons, and limes that I was using. I went into my garden and plucked Magnolia flowers and Hosta leaves. My guests asked ‘How did you think of that?’ That’s the “Wow” factor we aim for at Legendary.” One of the biggest trends in floral arrangements this year is unconventional centerpieces and using fruit is sure to catch guests by surprise. These arrangements add vibrant colors that dazzle the eyes and citrus fruits provide a fresh aroma that brings the sunshine inside. 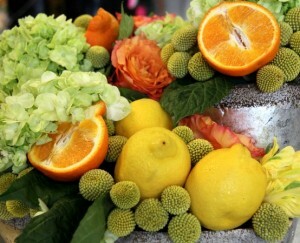 To jazz up tables and place settings, slice freshly picked lemons, limes, oranges, grapefruits, or bergamots. Combine different fruits for a fresh and clean arrangement. Try sliding lemon slices into a clear vase, and then fill it with flowers and ice water for a “Legendary” look. Simple and sophisticated, this is a solar flare that will keep your company coming back for more. This entry was posted in Uncategorized and tagged Atlanta Wedding, award-winning floral, citrus, Legendary Floral, seasonal, summer bouquets. Bookmark the permalink.